This easily could have come out of the mouth of Donald J. Trump at any of his pre- or post-election “Make America Great Again” rallies. It, however, represents the paraphrased words of Fritz Julius Kuhn, a naturalized U.S. citizen and leader of the German American Bund prior to World War II, who stood erect on a stage on February 20, 1939 in front of over 20,000 applauding spectators at New York City’s Madison Square Garden below a giant banner of U.S. President George Washington who allegedly never uttered a lie. Upon hearing these words, a member of the audience, Isadore Greenbaum, an unemployed plumber, lunged the stage at Kuhn and was quickly pummeled by uniformed police officers and Bund guards to the cheering delight of the crowd. Long before the U.S. entry into WWII — as also we have witnessed in our current Trumpian age — the true U.S. humanitarian patriots, as opposed to the radical nationalists, mounted a clarion call to action and resistance. While lesser-known than the German American Bund rally of 1939, a full 7 years prior, also at the famous Madison Square Garden, several groups and personalities organized an Anti-German Boycott rally on March 27, 1933, only weeks following Adolph Hitler’s ascension to the high position of German Chancellor. Even prior to the Nazis taking power on January 30, 1933, they had heightened the already prevalent fear and suspicion of Jews, and engaged in widespread antisemitic acts of harassment and violence, which escalated sharply with Hitler as leader. Several groups supported the American Jewish Congress’ call for a Madison Square Garden Rally, including the American League for Defense of Jewish Rights, B’nai B’rith, the Jewish Labor Committee, and Jewish War Veterans. A roster of prominent individuals spoke out on stage, including former New York governor Al Smith, Senator Robert Wagner, mayoral candidate Fiorello LaGuardia, Rabbi Stephen Wise, and several Christian clergy. An overflow crowd attended the rally with 23,000 spectators inside and another 20,000 listening from speakers outside. At least 70 parallel events occurred simultaneously across the nation in such cities as Baltimore, Boston, Chicago, Cleveland, and Philadelphia. Throughout the following year, government leaders, including President Roosevelt and Secretary of State, Cordell Hull, and most of the domestic press downplayed and whitewashed Chancellor Hitler’s terrorist tactics against German Jews and other group marginalized by the state. Led by the American Jewish Congress with the support of numerous non-sectarian organizations, including the American Federation of Labor, the American Civil Liberties Union, and Actors Equity, they took the unusual and creative step of issuing a 21-count indictment and sponsoring a people’s trial at “the High Court of Humanity.” They called the trial “The Case of Civilization Against Hitlerism,” which they held at Madison Square Garden on March 7, 1934.
Notable public figures spoke at the trial, included former Secretary of State Bainbridge Colby, who served as the presiding judge, and Samuel Seabury as the lead prosecutor. Arthur Garfield Hays also joined the team of prosecutors. Hays was serving as general counsel to the ACLU and was known for his expertise in defense of people accused in several high-profile cases such as the Scopes Monkey trial, the trial Italian anarchists accused of murder, and the “Scottsboro Boys” trial (nine black teenagers accused of assault in 1930s Alabama). Hays also helped in the defense of five Communists whom Hitler accused of torching the German Reichstag building in early 1934. Organizers of the trial against Hitlerism invited Germany’s ambassador to America, Hans Luther, to serve as chief attorney for the defense, but he failed to attend. At the start of the trial, the standing-room-only crowd of over 20,000 people rose and maintained silence as a bugler from the American Legion performed taps in honor of people murdered in Nazi Germany. Twenty one witnesses appeared for the prosecution to give truthful testimony of Hitler’s criminal offenses against everyone including but not limited to Jews of Germany. Catholic magazine editor Michael Williams, for example, characterized American Catholic views of the realities of German Catholics. Dr. Lewellys Barker, professor of medicine at Johns Hopkins University, related Hitler’s exploitation and perversion of the German medical profession. American Olympic Committee member, Gustavus Kirby, discussed the Nazis’ exclusion of Jews from German sports. And editor Stanley High painted a brutal picture of the mistreatment of writers in Nazi Germany. The press later reported that Secretary of State Cordell Hull successfully lobbied for the resolution to be killed in committee. Members of the audience/jury, according to the New York Times, “roared their whole-hearted approval” for a “guilty” verdict. 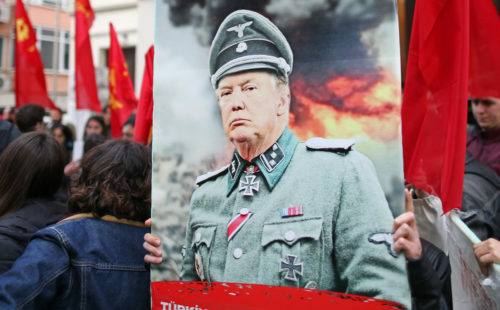 Though symbolic, the people’s trial of Hitlerism increased participation in the resistance against oppression, not unlike the women’s marches and other visible forms of resistance to Trumpism. Though the justice system traditionally refrains from indicting a sitting president, and though we have no clear indication of the conclusions of the Mueller Commission and other investigations’ findings, or whether the Congress will impeach and convict Donald J. Trump of committing “high crimes and misdemeanors,” we the people of the United States continue to organize and act on creative means to unseat this criminal against humanity. Although historically the United States has ventured down parallel paths, we are not destined to complete the terrible existential journey traveled by the Nazis. If we take action now.